Hillside Equestrian Meadows' Laki moved to the top of the MATCH Series overall points standings after he was placed first on a disqualification in the $100,000 Polynesian Stakes, fourth leg of the 3-Year-Olds and Up Sprint—Dirt Division, Aug. 12 at Laurel Park. In one of the closest finishes in this year's series, favored Lewisfield and Laki battled from the top of the stretch to the wire in the seven-furlong Polynesian, with Linda Zang's Lewisfield a nose in front and the end. The stewards, however, ruled that Lewisfield drifted out and caused interference in deep stretch. Lewisfield, based at Hollywood Casino at Charles Town Races with trainer Jeff Runco, entered the Polynesian with 12 points and the division lead. He picked up 7 points for finishing second and is now second with 19. 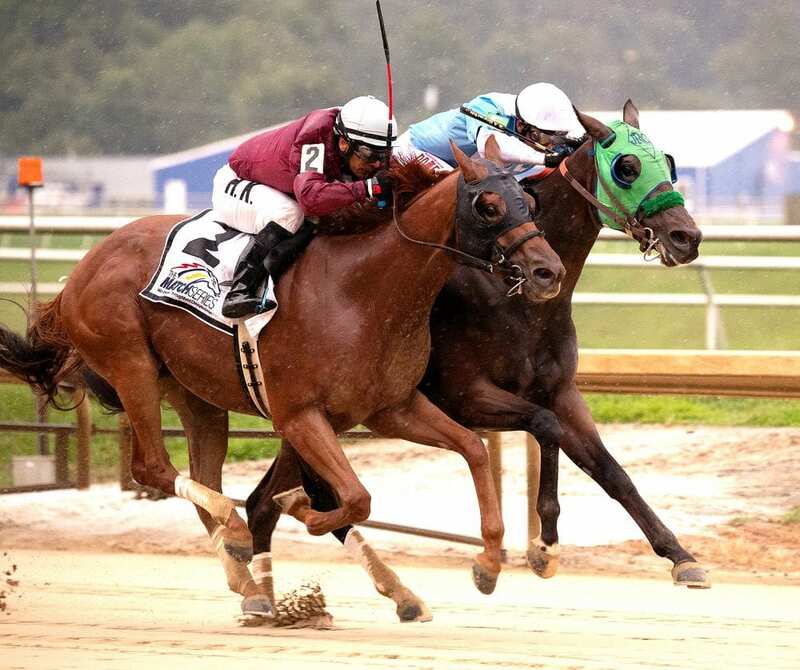 The Maryland-bred gelding is now eligible for MATCH Series bonus money as well as bonus points should he compete in the final division leg, the grade III, $250,000 Frank J. De Francis Memorial Dash at Laurel Sept. 15. Laki has now competed in the first four legs of the division, and thus picked up 5 points along with 10 for his first-place finish in the Polynesian. He already had 8, so that gives him 23—one more than both Page McKenney (3-Year-Olds and Up Long—Dirt Division) and Oak Bluffs (3-Year-Olds and Up Sprint—Turf Division) for the overall lead. The final time for the seven furlongs on a track rated good after a storm blew through was 1:23.24. Laki, ridden by Horacio Karamanos, paid $16.60 to win as the third choice. Rockinn On Bye finished third. Runco, who watched the head-one replay in the winner's circle while waiting for the result, said he thought the call could go either way. Laurel-based Damon Dilodovico, who trains Laki, agreed. Dilodovico said the De Francis Memorial is a target for Laki. Larry Johnson's It's the Journey also now qualified for bonus money given the fact the Polynesian was his third start in the division. Laki, Lewisfield and It's the Journey are all Maryland-breds, and the breeder of the highest point-getting Maryland-bred in the overall MATCH Series is eligible for a $5,000 bonus from the Maryland Horse Breeders Association. This entry was posted in Racing and tagged laki, laurel park, lewisfield, MATCH, match series, Polynesian Stakes by MATCH Series Release. Bookmark the permalink.